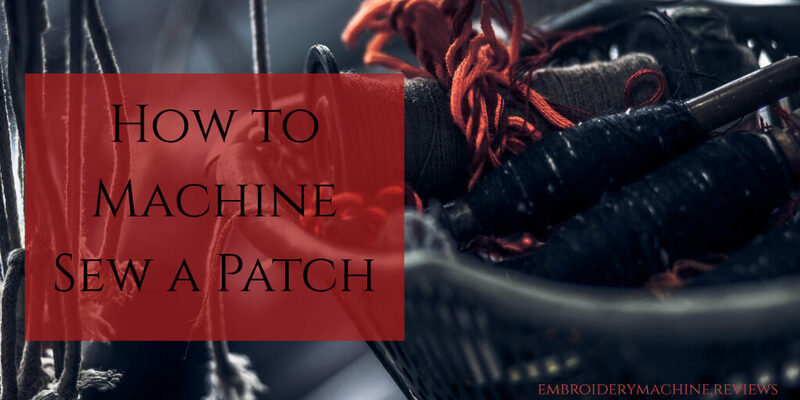 This article is all about machine sewing patches and focuses on two great Youtube tutorials. The first is called ‘how to machine sew a patch’ and the second is about sewing patches onto jeans. Watch the videos and read our tutorial as you go. Sewing patches onto your clothes is one easy way to spruce up an old jacket, shirt, or jeans. To start out, get out an ironing board and lay your jacket, shirt, or whatever you’re going to sew a patch on flat. The next step is to lay your patches out in the order you want them as shown here at 0:49 with the sticky side down. The next step is to heat up your iron on a cotton setting and place it directly over your patch as shown here at 1:09. This step will melt the glue on the back of your patch and start to adhere your patch to your medium so its easier to sew later. Your patch may stay with just this step, but if you want to ensure it’s a permanent solution, sewing it down is essential. Once your patch is glued down, you can set up your sewing machine with whatever thread you like. As this patch has glue on the back, you won’t need to pin it down additionally before you start to sew it. Also, if your patch comes with a slight border like the patch shown on 2:52. If you’ve never sewn a patch on before, you may want to start with a more simple design like a square or an oval. Once you get the hang of it, you can move on to more complicated patch designs. As she explains at 3:03, a square shape is very simple to do, and even if she ironed an odd shape patch first, she’d go back and pin it by hand just to ensure it stays in place while she sews it. When you start sewing your patch on, you want to start slow and make sure you keep your material, and your patch flat as she does at 3:40 Continue to sew your patch until you come to the corner. When it comes time to change the position and sew along the other side of your patch, make sure your needle is set down into the fabric in the corner of your patch, as demonstrated at 4:00. Once the needle is set in the corner of the fabric, lift up the foot on your sewing machine. You can now rotate your fabric, so the side you want to sew is facing you as she does at 4:10 and put the sewing machine’s foot down. Repeat this step as needed until you come to the starting point on your patch. Once you’ve reached the starting point, you can stop sewing and clip the threads. You want your patch to look good on the front, but it should also look good on the back as you can see at 4:50. Your goal is to have flat, even stitches on the back of your patch as well as the front. If you have a pair of jeans or a favorite jacket that has a hole you want to patch, this tutorial is for you. If you’re going to patch a pair of jeans, the first thing you do is turn them inside out as you can see at 0:08. Once your jeans are inside out, you want to cut along the outside edge and cut away any stray strings or excess threads that are around the hole as you can see at 0:17. By cutting away all of these strands, you’ll give yourself a flat, easy surface to work with as he has at 0:36. You can also purchase commercial patches or pieces of canvas work well too. Once you’ve selected your patch material and cut it to the shape you want it, you can put your jeans on your sewing machine. You can see this step at 0:57. You want to pull your jeans through your sewing machine until the backside of your tear is under your sewing machine’s foot and place your patch on the inside of your jean’s tear like at 1:07. Once you have your patch situated on the back edge of your tear, set your pressure foot down and double check that your jean’s edge is firmly covered by the patch like at 1:20. Make sure you hold your fabric and your patch firmly as you slowly begin to sew along the tear as is demonstrated at 1:30. When you get to the end of your patch, lock your thread and snip it off as he does at 1:50. Once that is done, pull your fabric back through so you’re sewing the other side of your tear as he demonstrates at 2:10. Once you’ve pulled the fabric back through, set your pressure foot down at the corner and make sure your patch and your fabric are straight and flat. As he mentions at 2:22, this part will be slightly tricker because you want your tear edges to be close together but flat. When you’ve got your edges semi close together, start slowly sewing along the edge while keeping your jeans flat as he does in 2:38. While you’re sewing your tear, periodically check under the patch to ensure you’re sewing both pieces of fabric, and that it’s staying flat. When you get to the end of the patch, press your needle into the fabric and rotate your fabric as he does at 3:05. You’ll drop your pressure foot and sew back and forth to lock your stitch like in 3:22. Once the stitch is locked, you can pull your jeans through repeat this process with the other end to complete the patch job. The final step to finishing your patch is to flip your jeans the right way and snip any ragged ends to clean up the patched area as he does at 4:00.